One Eternal Day: "The bullet is in me now..."
The assassin was John Schrank, an opponent of Presidential third terms who had followed TR for thousands of miles, finally finding his opportunity in Milwaukee. Shrank wrote that the ghost of William McKinley had advised him in a dream to avenge his [McKinley's] death by killing Roosevelt. .... He [TR] stopped for the afternoon at the Hotel Gilpatrick, and after dining with local dignitaries, readied to leave for the Milwaukee Auditorium (now the Milwaukee Theatre) to give a campaign speech. As he was getting into his vehicle, Roosevelt paused on the floorboards to turn and wave goodbye to well-wishers. Unfortunately, this moment cleared the way for would-be assassin, John Schrank, to take the shot he had been plotting for more than three weeks as he followed Roosevelt's campaign across eight states. Schrank fired his .38 revolver from close range, hitting Roosevelt in the chest. 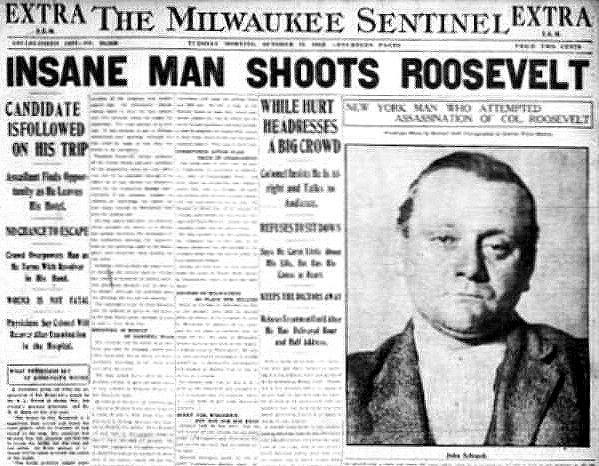 Upon entrance to the Milwaukee Auditorium, Roosevelt announced to the stunned audience that he had been shot, proclaiming: "It takes more than that to kill a Bull Moose!" He then proceeded to speak for 80 minutes before reluctantly going to a Milwaukee hospital for treatment. Only after the speech did Roosevelt permit himself to be taken to the hospital The bullet was not removed and remained in his body for the rest of his life. A transcript of the eighty minute (!) speech is here. Schrank was arrested at the scene and Milwaukee officers had to protect him from the crowd. On November 12, 1912 Schrank pled guilty to assault with intent to commit murder. He was found insane by the court and sent to Northern Hospital for the Insane located in Oshkosh, Wisconsin. Shrank died not long after FDR became President.